It doesn’t happen very often in San Diego, but when we have a good downpour I love to head to a café with big windows so I can look out at the rain while holding a cup of warm coffee. I feel a bit forlorn doing so, but it also gives me time to think. 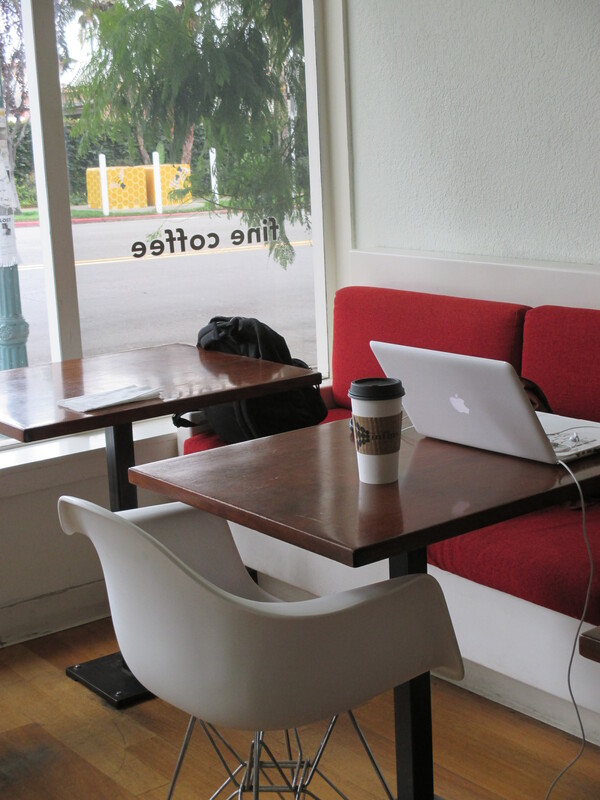 The big windows at Influx Café in Golden Hill gives me just this setting that I love on a rainy day. And what’s not to love about their strong Café Moto coffee? I also love their cool modern design chairs (see the midcentury chairs in the photo below). It’s not pouring yet today, but rain is predicted so I’ve got my umbrella ready for a dash to Influx at the first sight of rain. If you’re not near Golden Hill there is an Influx Cafe in Little Italy at 750 W. Fir (at India St.) and North Park at 3000 Upas (at 30th St.). Both of these locations have big windows, too. Here’s to rain…we need it & it’s a great excuse to stay indoors drinking coffee! But have a few quarters in your pocket for the Little Italy parking meters (you’re okay in Golden Hill & this part of North Park). This entry was posted in Coffee shops in San Diego and tagged Golden Hill, Little Italy, North Park. Bookmark the permalink.